Today's quote comes from The Very Thought of You by Rosie Alison, which is the story of a young girl who is evacuated from war time London to a big house in the country. Wow. That's an emotional quote. 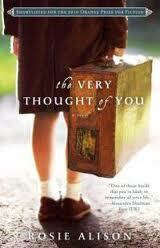 I didn't know this book was about London evacuees! Now I am much more interested in it, especially after reading that post. Oh, what a moving and thoughtful quote today. I often forget how much I have to be thankful for, and this quote certainly reminded me of that today. Thanks for posting this and making me rethink my holiday attitude.